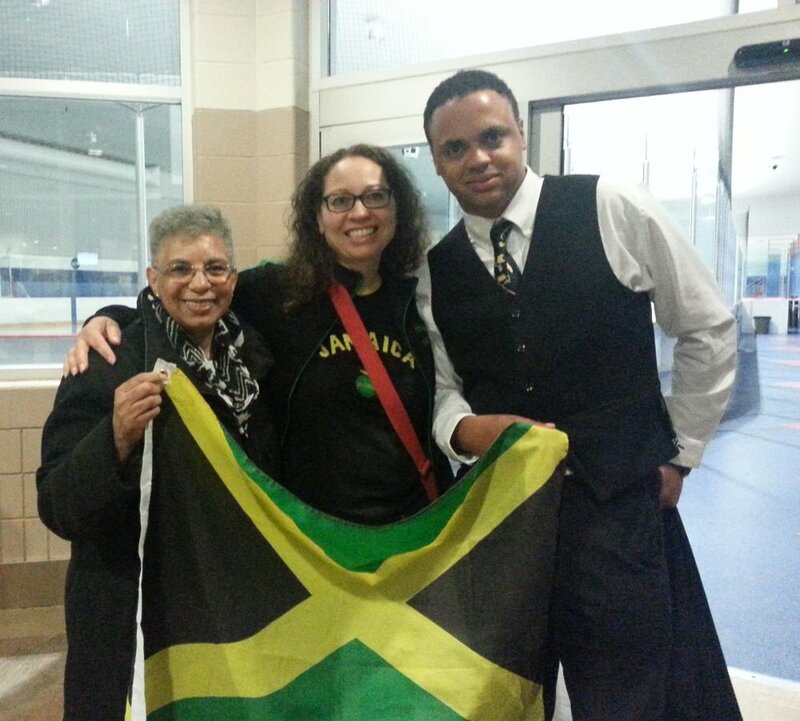 Edmond R. Phillipps – affectionately known as “EJ" – is an amazing young hockey player/coach of Jamaican descent who has been playing ice hockey for 19 years and coaching for 7 of those years. EJ is currently a master coach at a USA Hockey Level 5 Certification. The love of the sport was shown at age 7, when both father and son went to investigate where EJ could learn to play and what was involved to make it happen. Two hours later, they entered the house with three large bags of hockey equipment, both grinning from ear to ear. EJ’s mother smiled and said knowingly, “I take it you found a place where Edmond can learn to play hockey.” The love of the game and the passion for the game continues. Ed’s suggestion to EJ to merge his passion for the game and his heritage has been the foundation of this incredible project. EJ’s paternel grandparents are Jamaican born. Ed is an experienced mechanical engineer with a diverse background in design, development and manufacturing with expertise in electrical/mechanical systems; qualification and reliability tests. Mr. Phillipps has proven knowledge in engineering enhancement to air and water cooled chillers systems, commercial refrigeration systems, automotive air conditioning components and commercial food equipment. Among his many engineering accomplishment was in 2014 being awarded U.S. patent 8.847,120 for the internal oil monitoring system (IOMS). Ed currently works as an engineer in the telecom industry. With 32 years of working with the Jamaica Olympic Association (JOA) in top capacities (1st Vice President), Mr. Anderson’s sports and business acumen excels to the task of assisting JOIHF in meeting its goals of introducing the first Jamaica Ice Hockey team to the Olympics as well as training up and coming potential athlete players via its Grass Roots Program to aspire to greatness in hockey. Besides an active sportsman himself representing Jamaica at Field Hockey, Squash as well as senior grade Cricket and Soccer, Mr. Anderson’s book, Seoul to Beijing – An inside view of Jamaica in the Olympic Games, attests to his love of his country championing its struggles -- and outstanding, dedicated passion for all genres of Jamaica’s sports contributions and world records. It is the Olympics sports textbook for JOIHF. Don was awarded the Order of Distinction (Commander Class) by the Government of Jamaica in 2007 for excellence in Sports Administration. This is the nation’s fifth highest national honour. He was recently given the prestigious Chairman’s award for 2017 in the Annual Sportsman and Sportswoman of the year function and currently serves as Chairman of the Professional Football (Soccer) Association of Jamaica and head of the government’s National Sports Museum Development Committee. Being a member of the management team for Jamaica for 7 consecutive Olympic Games from Seoul in 1988 to London in 2012 and head of the delegation for ﬁve of those, Atlanta 1996, Sydney 2000, Athens 2004, Beijing 2008 and London 2012. Director of the Caribbean Association of National Olympic Committees (CANOC), from 2004 to 2013, currently Director of CANOC Broadcasting Inc (CBI) which brought the television coverage of the 2016 RIO Olympics to the entire Caribbean, Director of the Caribbean and Central American Sports Organisation, CACSO (involving 31 countries in the region) from 2005 to 2013. Mr. Anderson also serves as a laison consultant to JOIHF regarding matters in Jamaica. Sean Caple has owned and operated “Colorado Hockey Development Camp” for the past 8 years and is the distributor of “Shot Tec” for the State of Colorado. He started his coaching career in 1999 before moving to Denver, Colorado from Canada in 2000. Since then he has been involved at every capacity in youth hockey. Sean holds a Level 5-Master Coaching Certification through USA Hockey Intermediate Coaches Certificate from Hockey Canada. In addition, he has worked privately with players of all levels including NCAA and NHL draft picks. He also worked with the NHL during the 2001 and 2002 All-Star games as an on-ice instructor for “NHL Cool Schools" hockey clinics. Mike Rickett M.S., C.S.C.S., has been in the fitness industry for more than 25 years as a competitor, trainer, and educator. His background includes a bachelor's in psychology and a master's in exercise physiology. He has competed nationally as a runner, and aerobics competitor. In addition, he is a diverse personal trainer, who certifies fitness professionals and conducts continuing education seminars internationally. You can also see his work in news print, edited articles for professional health and fitness journals, and as an author of fitness training manuals. Brian Giffin has 21 years of leadership and management expertise in the family entertainment, youth athletics and not-for-profit industries. His experience includes business owner, executive leadership, corporate management and officer/director of not-for-profit organization. He possesses strong entrepreneurial business perspective with financial, human resources, marketing/sales and project management skill sets. A passionate leader who excels at planning, organizing and executing business plans, Brian is a highly motivating coach with hands on approach to team development. experience in both business start up and turnaround projects.